Malaysia is rapidly emerging as South-East Asia’s latest golfing haven with almost 200 golf courses currently available nationwide. 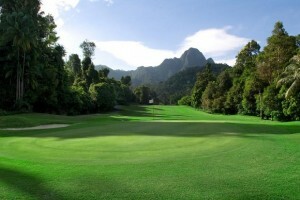 Golfers have the option of driving off in the cool lush greenery of the Cameron Highlands, or along the shores of a tropical beach on the fringes of the South China Sea. Ernie Els Design, headed by the South African golf great, is currently carrying out work to add to Malaysia’s stock of courses. The two developments are an 18-hole course at the eco-destination resort Teluk Datai, Langkawi, and a 27-hole course at the upcoming integrated luxury destination Desaru Coast, Johor. The 27-hole course will be one of the main attractions at Desaru Coast, a 17-km beachfront integrated destination on the west coast of Johor that features an array of luxury resorts, hotels and golf residences, complemented by facilities including retail malls and theme parks. The site is easily accessed by a short drive from Senai International Airport, Johor Bahru. In Teluk Datai, Langkawi, upgrade work on the 18-hole course at The Golf Club, Datai Bay is underway and this will be completed in 2013. In addition to the two courses, Ernie Els’ design team is also providing technical services for fellow golfer Vijay Singh’s course at Desaru Coast.